The first time as tragedy, the second as farce – the old Marxian aphorism comes unbidden as I contemplate the reappearance of the Birch Scare. You’ve heard of the Red Scare, of course, as a time of evil, when honest pinkos were tarred as Commies and a monster called Tail-Gunner Joe roamed the land. I’ll bet you haven’t heard of the Birch Scare, however, a weirdly parallel phenomenon that occurred during the early 1960s, when the John Birch Society first came to public attention. The Birch Society was founded by Robert Welch, a candy maker, a rather mild-mannered and courtly man who for a while was excoriated by the liberal media as a veritable devil. After first being denounced by the neoconservatives of his day in an anthology titled The Radical Right, Welch and the Society found themselves inundated by a series of hysterical journalistic attacks that portrayed them as demonic hate-mongers secretly plotting to overthrow the government. Breathless exposés appeared almost daily in the mainstream media, warning against the dire Birch menace: they were organized into secret "cells," and they were spreading their message of "hate" and "division" – well, you know the drill. In reality, Welch was a rather idiosyncratic example of an Old Rightist, that breed of conservative that died out with the death of Robert A. Taft and Colonel McCormick‘s Chicago Tribune. Sure, he had some, ah … exotic views, but in essence he was just a good old fashioned anti-Communist whose suspicion of what he called "internationalism" eventually led him to oppose US military adventurism overseas. 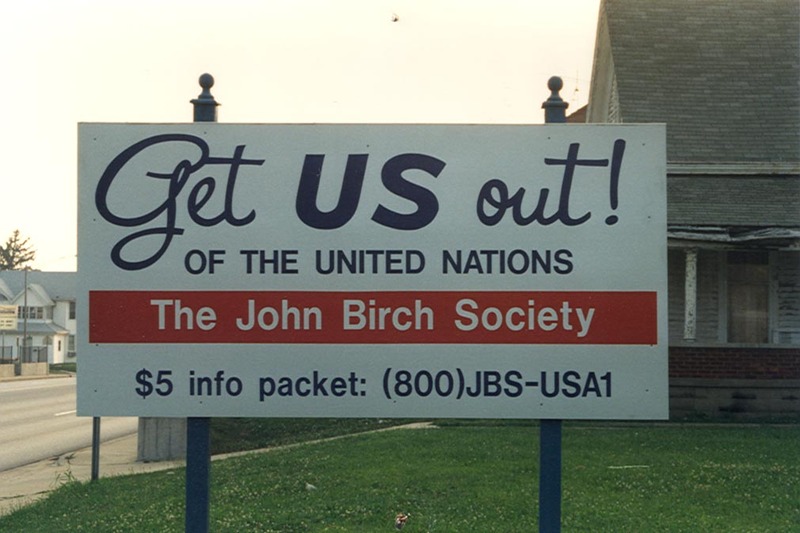 In a mid-1960s edition of the Birch Society’s internal bulletin, he denounced the Vietnam war and proposed that the Society initiate a campaign to extend their slogan of "Get US Out" – which had previously applied to the United Nations – to mean get us out of the war. That’s why it was funny to watch MSNBC’s "news" anchors rail on and on about how the Birchers – who had been allowed to co-sponsor CPAC – had re-"infiltrated" the conservative movement, and isn’t it horrible, blah blah blah. They then had the nerve to trot out Buckley‘s ghost, wondering why WFB’s famous "excommunication" of the Birchers had been rescinded. If only those commie-hippie-liberals realized that one of the principal reasons given by Buckley for the anti-Bircher interdict was Welch’s opposition to the Vietnam war. The Birchers were tolerated as long as they confined themselves to rehashed McCarthyism – after all, Buckley had written a book defending the red-baiting Senator, although somewhat half-heartedly. And of course McCarthy’s downfall occurred when he started targeting alleged Communist infiltration of the US military – an investigative thread that Welch simply took up and elaborated on. The Birchers’ real sin, in Buckley’s eyes, was to oppose the Warfare State as much as they opposed the Welfare State. They were the first to alert conservatives to the dangers of George Herbert Walker Bush’s "New World Order." And when Bush II moved to implement and complete his father’s hegemonist dream at gunpoint in Iraq, the Society strongly opposed the war – unlike various and sundry "liberals." When liberals who know or care nothing about the history of the conservative movement trot out Buckley, you know they’re up to no good. They claim they want to "understand" what’s going on with the tea-party movement, and the identity crisis on the Right, but their "analysis" is just a lot of ideological ax-grinding. There’s no real attempt to come to grips with the issues raised by the Ron Paul movement, and the much wider wave of discontent that is now rolling across the country. The anti-interventionist, anti-government trend in the GOP, represented by the Paulian triumph at CPAC, is really just a delayed reaction to the end of the cold war and the promise of a return to normalcy. You’ll recall, back then, when the Berlin Wall fell, conservatives came around to a non-interventionist outlook. Bill Clinton’s promiscuous meddling in affairs that should have been none of our business accelerated a trend that would have developed naturally anyway. What happened to interrupt this growing "isolationism" was 9/11. Yet as signal an event as that was, as hard as it hit the American psyche and changed our politics, the objective circumstances that gave rise to anti-interventionism on the right are still present and on the increase. To begin with, there is no worldwide ideological challenge to liberal democracy, no competing universalist ideology like Communism seeking to claim the allegiance of the world’s peoples. The sectarian"appeal" of al-Qaeda and allied terrorist organizations is very narrow, strictly limited to the Muslim world: in any case, the threat posed by bin Laden is hardly equal to that posed by the old Communist International. This fact and the economic facts of reality – that we cannot continue to fund an overseas empire without going bankrupt – conspire against any "conservative" who wants to limit government and mobilize massive armies to occupy vast portions of Central Asia. In the midst of an economic crisis such as has not been seen since the 1930s, the War Party is at a loss as to how to drum up enthusiasm for yet another bout of Mideast adventurism. That they’ve even lost their most reliable allies in the conservative movement, which is now rallying behind the anti-interventionist champion Ron Paul, shows just how remarkably weak they have become. The Rabinowitz–Frum wing of the Republican party is small, and getting smaller by the minute: how many battalions does Powerline command, anyway? and Pakistan – has every reason to find Ron Paul and his supporters "scary. "So do the neocons, the vultures of the American politics, who hover over every battlefield cheering on the slaughter. I revel in their fear: it gladdens my heart and sustains me. Because it means, not that we’re winning, necessarily, but that we can win. And in a battle of this kind, so hard and unforgiving, that makes all the difference. Previous Previous post: Learning From History: Can the US Win the Afghan War?